Since The Ohio State University South Centers began hops research and educational programming in 2012, more than 100 farmers have become attracted to hop growing due to the continued demand for Ohio-grown hops from the craft brewing industry, and the high value crop opportunity hops offer to small acreage landowners. Decades after disease and prohibition wiped out hops production in the Midwestern United States, Ohio’s hop acreage is making a comeback, rising to 200 acres from roughly 10 acres in 2012, according to Brad Bergefurd, Agriculture and Natural Resources Extension Educator and Horticulture Specialist with the OSU Extension in Scioto County and at South Centers in Piketon. Hops can cost $10,000 or $20,000 per acre to plant, according to university crop production budgets and research. An Ohio brewer, consumer, and hop farmer survey – conducted by the Ohio Hops Growers Guild and partially funded through a grant by the South Centers USDA Cooperative Development Center – indicated over recent years that breweries in Ohio want to buy local. Just as with all local direct agricultural marketing opportunities in Ohio, brewers want to put a face with the farmer growing their hops, which is a big selling point for Ohio brewers. The hop farmers survey results indicated that nearly every hop grower in the state intends to plant more hops in the near future. To advocate for, and educate, the state’s hop farmers, roughly 70 growers have joined the Ohio Hops Growers Guild, which released a set of standards for a seal of quality for hop growers to help guarantee high quality and food safe hops continue to be produced for Ohio craft breweries. If a brewer has a bad experience with poor quality hops because the farmer does not manage their crop properly, it hurts hop growers in general, just like someone who makes lousy beer taints the entire industry. Hops production is no get-rich-quick endeavor, according to research conducted by Bergefurd and the OSU Hops Research and Education team. It costs more than $10,000, and more than $20,000 for some farms, per acre to plant and the crop doesn’t produce a full crop until year three. Bergefurd and the other members of the OSU Hops Research and Education team have been conducting the development program since 2013 when they received USDA grant funding from the Ohio Department of Agriculture and planted the first hop research trials on record at The Ohio State University. According to Bergefurd, “as with any type of farming, if there’s a market to be had, we want to teach our farmers to be aware of the opportunity and see if it fits their farming operations. Hops quality is normally verified using laboratory wet chemistry methods that require reagents such as toluene, but these methods can be time-consuming and affect the cycle time of a facility. Due to the importance of harvest timing, and to ensure a high quality crop for brewers, in 2018 the South Centers began a research partnership with an international, Ohio-based company, Eurofins QTA, a subsidiary of Eurofins Scientific located near Cincinnati that has developed technology that provides a method of hop analysis which allows for hops to be tested for multiple parameters, such as alpha and beta acids, in 60 seconds using the latest in infrared technology – compared to three days to collect, mail, and test hops in a laboratory setting currently. This enhanced hop quality analytics equipment and procedures will allow farmers to determine prime harvest times quicker, and that can lead to increased hop quality for brewers. 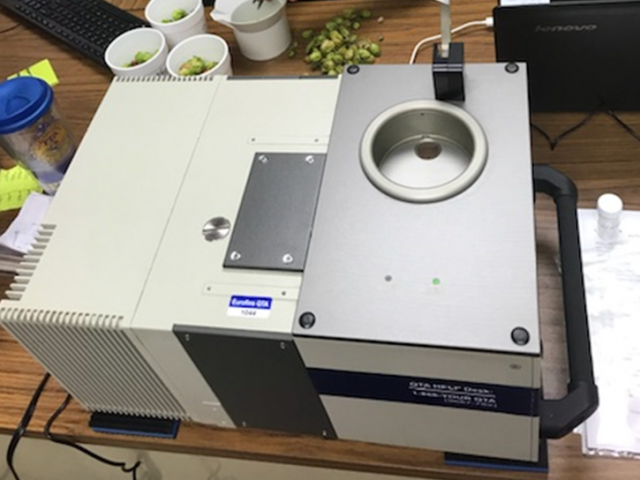 This new hop analysis technology was installed in the recently built hop and small fruit quality analysis lab at OSU South Centers in 2018. Preliminary test data from quality analytics of hops harvested from the OSU hop research yards and from farmer-cooperator hop yards indicates that this new technology can provide similar results to the current laboratory hop testing procedures, but within minutes instead of days. “By all accounts, the demand for hops is expected to continue to grow. So long as the brewing industry keeps pouring, bottling, and canning more craft ale, there should be a market for Ohio-grown hops,” says Bergefurd.